How do you terror-proof a major public building without turning it into a fortress? Benches and water walls are in, bike racks could be out and those pretty shrubs... they'll need to be well pruned. The attack on Glasgow airport and attempted car bombing in London's West End in June sparked a security review of the UK. In relating its findings to MPs, Prime Minister Gordon Brown said that "robust physical barriers", vehicle exclusion zones and making new buildings blast-resistant would become priorities. Hand luggage restrictions are to be eased but airport buildings remain vulnerable to the kind of attack seen in Glasgow in June. "It's been patently obvious for a long time that airports are susceptible to these sort of 'drive-by' attacks and we need to get better at protecting these facilities from vehicles being driven into them," says aviation security expert Chris Yates. Since June the perimeters of the major airports have been toughened with concrete and steel re-enforced bollards, and restrictions placed on private vehicles driving up to the buildings, he says. "The security perimeter has moved further out from terminals so only authorised vehicles can drive up to terminal buildings." That's a positive step forward but regional airports need to catch up, he adds. Technology that screens people walking into airports, to tell in a split second whether an individual carries explosives or traces of explosives, is soon to be piloted. And there could be greater use of number plate recognition systems that monitor access roads to airports for wanted cars. 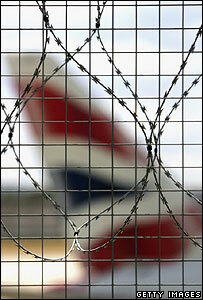 "But at the end of the day the problem is we can't shut down airports, you can't lock them down as you would a prison. People need to travel and you need to process people through that system as fast as possible." "It's important in designing any structure where people are going to gather to design security in from the beginning and not bolt it on afterwards because then there are bound to be holes in security." Sporting events are meant to be open public occasions. But the UK's largest terrorism trial, which led to the jailing of five men earlier this year, heard evidence of plotters considering poisoning beer or burgers at football games. Earlier still, an IRA bomb warning halted the Grand National horse race. Arsenal Football Club's Emirates Stadium in north London, which opened in 2006, is being held up as a model of how to design security into the heart of a new building. Emirates' strength, say officials, is that it has limited access to vehicles. The stadium's apron is ringed with subtle obstacles that would prevent a car bomb from getting near. Concrete planters and benches are deliberately placed to prevent a car weaving through them to reach the stadium itself. 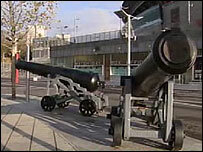 Giant cannons, part of the club's insignia, can stop a moving vehicle. The architects placed the club's name in dramatic giant lettering at a critical access point. Those letters are not just there for aesthetic effect - they could stop a seven-tonne lorry. As for evacuation, the stadium has clear and broad exit routes to ensure that people can get out quickly. Not every club can copy Arsenal - so officials ask them to focus their security thinking on key factors. One critical issue is that clubs must be alert to the first stage of attack planning: reconnaissance. Take advice, they say, on how to spot someone who could be looking for a means to attack their target. Security at 150 major railway stations is to be strengthened, said Mr Brown. Rail expert Christian Wolmar says this will probably mean deterring vehicles from getting near the entrance to stations, in the same way that bollards and vehicle exclusion zones have been placed outside the new St Pancras station in London. But any moves to introduce airport-style screening - a system was tested at Paddington station - would not work, he believes. "There's a sense of panic about this. The truth is that railway stations cannot be protected from people carrying bombs like on 7/7. You can't check everyone coming into railway stations. The numbers involved are far greater than aeroplanes." He fears the penalty will be paid by innocents like cyclists who will no longer have bike facilities, a problem highlighted at St Pancras and the Emirates Stadium. "We can't let them win by changing our way of life. We need a bit of the Blitz spirit." London's Ministry of Sound nightclub and Bluewater shopping centre in Kent were targeted by men jailed earlier this year. Existing infrastructure poses a problem, says Lord West who led Mr Brown's security review. For example, some shopping areas had been built in a way that made them more likely to emit shrapnel in an explosion. New shopping centres will instead be blast-resistant and anti-shatter film should be used on glass windows. Advice issued to shopping centres by the National Counter Terrorism Security Office says non-essential cars should be kept at least 30m away from the buildings and there should be traffic calming measures to prevent vehicles picking up speed. Barriers should be used to prevent "hostile vehicles" getting access through goods entrances and litter bins should be taken out and vegetation and trees pruned. Protective water walls that spring up from the pavement are being developed by firms such as Cintec. They could eventually provide an alternative to ugly barricades but although effective in withstanding a blast, the technology still needs refining. But the collective effect of terror-proofing buildings will have a knock-on effect on design. Austin Williams of the National Building Specification believes it is contributing to the "death of architecture" because aesthetics are being sacrificed for the sake of precaution. Public buildings, he says, are becoming "fear of public" buildings. But architect Peter Blockley believes the industry has the imagination to meet the challenge without detracting from style. The security of key public buildings has changed dramatically in the UK since September 2001. In London alone, the fabric of security has become highly visible around key institutions. Twenty years ago it was relatively easy to get close to the official home of the Prime Minister. In 1989 wrought-iron gates were installed, although they didn't stop the IRA's failed mortar bomb attack of 1991. Today, Downing Street is protected by heavily-armed police and barriers that will prevent a vehicle ramming into the narrow street. Parliament is now ringed by a waist-high wall of concrete and black steel barriers. 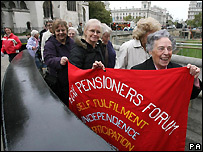 It is impossible to get a car at speed near the main elements of the Palace of Westminster. One of the most subtle but important changes at Parliament demonstrates a significant change in security thinking. Before the 9/11 attacks, screening of visitors, including bag scanning, took place inside St Stephen's Entrance. Now, that screening takes place outside - meaning that security officials have a greater opportunity of identifying a potential security risk before the building is compromised. A new purpose-built visitor entrance is being constructed. Another building with similarly high levels of exterior security, before entry to a cordon sanitaire, is the US Embassy. Much of the thinking around public buildings began in 1970s Belfast as the government responded to the IRA's use of car bombs. Part of the strategy is to plan "territorial security" far beyond the actual target. In the case of Downing St, this meant restrictions on parking in Whitehall after the 1991 IRA attack. Below is a selection of your comments. Security, 1970s style, killed off Belfast City centre, it took a generation to recover. I'm concerned it's being used as a model as basically the public realm was destroyed in the city. The government would like us all to ride bikes to combat global warming and improve our health but when we reach the end of our journey there may be nowhere to put them because of fears of terrorism. All these measures are very interesting but as Napoleon once said: "If you give your enemy only two choices, he will inevitably take the third"